Valentine's Day is coming up in a month and a half, and aside from Christmas, it's the biggest seller for seasonal greeting cards! So we should get going on some Valentines in the next little while. Hopefully, you will see a design you like that you can CASE for your sweetie(s)! When my kids were little, my hubby and I always gave each of them a special valentine at breakfast that morning, and there was that special ritual of preparing valentines for everyone in their classes. I know that there are those who believe you should only give a valentine card to your love: husband, wife, boyfriend or girlfriend, but I think anytime you can let someone know that you love them, you should spread the love around! With the Occasions Catalogue gone live now, I thought I would showcase some of the products from it. Of course, the show stopper is the Bloomin' Heart Thinlit Die. It's so intricate and gorgeous. 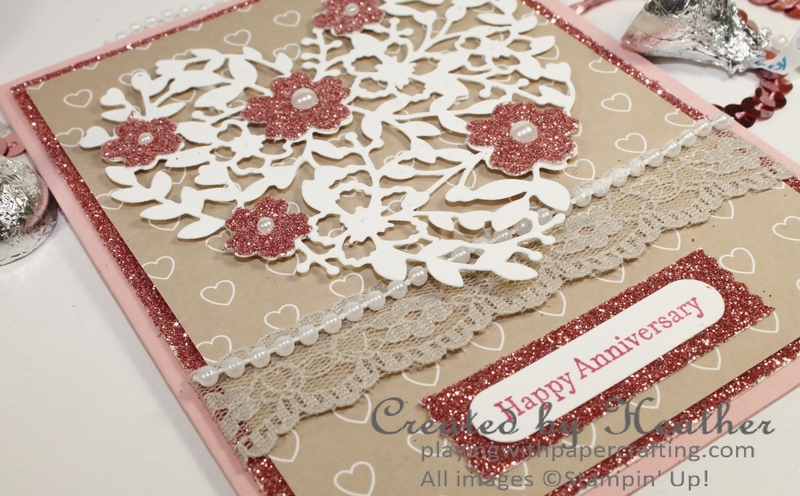 You can add flowers of a different colour or paper to it with the flower dies that come with it. But with the intricacy of the die comes the difficulty getting the paper out of the die and removing all the little bits. Stampin' Up! 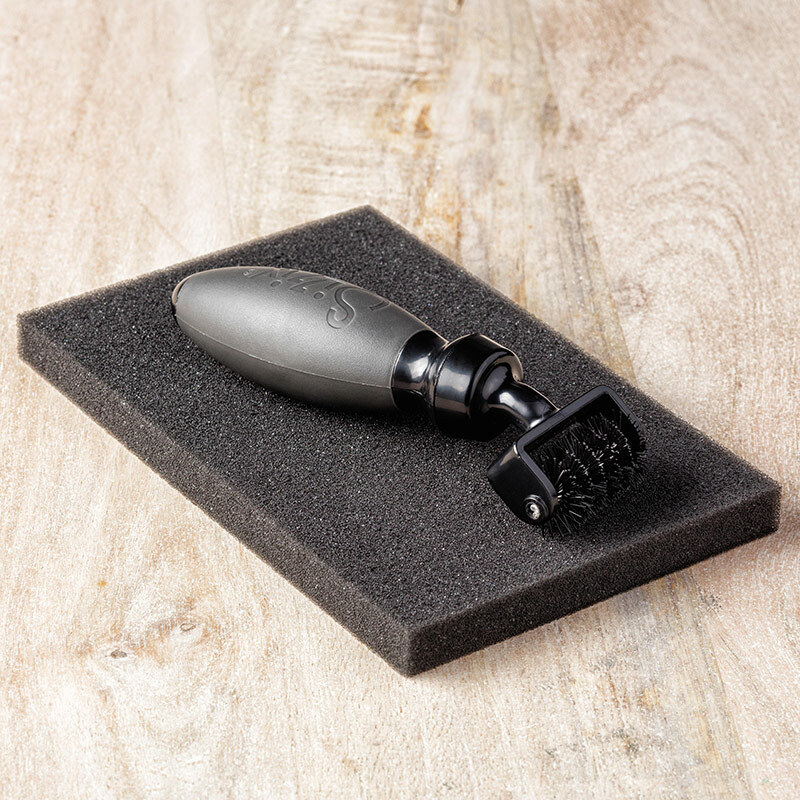 has introduced a new tool with this Occasions Catalogue for just that scenario: the Big Shot Die Brush. With this tool, you lay the die with the paper in it (after you have put it through the Big Shot) paper side down on the foam pad and roll over it like you would a brayer with the rolling brush. It easily removes the paper from the die, and the little bits stick to the foam as the brush rolls over them, removing most of them from the die cut image. This is a must have, especially as the dies get more intricate! You can find it on page 19 in the Occasions Catalogue. The background paper is from the new Love Blossoms Designer Series Paper Stack, which consists of 48 double sided sheets of 6" x 6" Design Paper with valentine themes but also floral and more generic patterns you can use after Valentines is over. It's a good value. 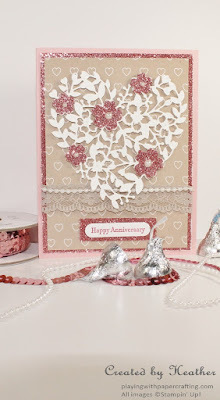 The Blushing Bride Glimmer Paper is a winner as well. Two 12" x 12" sheets should give you enough for most of your Valentine cards. It's great for other projects as well. 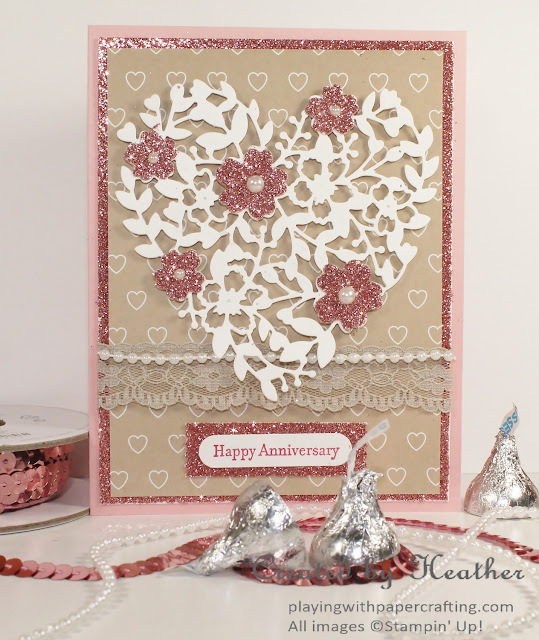 I went looking for a small Happy Anniversary sentiment in my stash and all I could find was this old familiar one from Teeny Tiny Wishes, which still comes in mighty handy quite often. I punched it out with the Word Window Punch and mounted it on a backing of Blushing Bride Glimmer Paper, punched out with the Washi Label Punch. 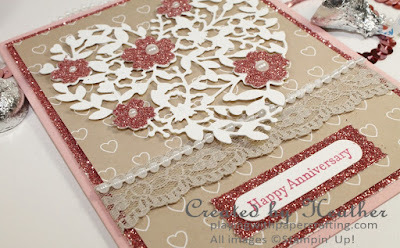 If you were to order the Bloomin' Love Bundle which consists of the Bloomin' Love Stamp Set and the Bloomin' Heart Thinlits Dies, plus the Love Blossoms Designer Series Paper Stack and some Blushing Bride Glimmer Paper, your order would come to $60.25 before tax and shipping which is just the perfect amount to earn you a Sale-A-Bration reward! Hope you haven't had any trouble ordering from the new catalogue. I am putting in an order tomorrow night, so I can add yours to it if you want to let me know what you would like to order. If you don't yet have a catalogue, just ask and I will get one to you.